Vancouver, B.C. to the Mexico border is about 1,850 miles as the bike wheel turns. But the pedaled path was much longer to my new guidebook, Cycling the Pacific Coast: The Complete Guide from Canada to Mexico.After two years of research, numerous trips and uncountable miles — and a year in writing and production — I am happy to announce the book’s release. It’s here! And ready to help you to discover what I found out: The coast delivers an epic ride. I’m going on the road with a colorful slide show to celebrate its release. Come and see for yourself why this is America’s number one adventure cycling route. Tuesday, Oct. 24 — Outdoor Enthusiasts Series, Opera House, Marysville, 6 p.m.
Wednesday, Nov. 1 — Peninsula Wilderness Club, Bremerton, 7 p.m.
Tuesday, Nov. 7 — University Book Store, (Facebook event), Seattle, 7 p.m.
Wednesday, Nov. 15 — Official launch party at Cascade Bicycle Club! (Map)Snacks, beverages and books for sale/signing. Part of the Cascade Presentation Series, (Facebook Event) co-sponsored by Mountaineers Books with beer by Flying Bike Cooperative Brewery. Cascade Bicycle Club Education Room, Magnuson Park, Seattle, 7 p.m.
Saturday, Nov. 18 — Get Outdoors Book Fair, Seattle Audubon, Seward Park Audubon Center, Seattle, 2 p.m. If you’re outside the Puget Sound area, look for my presentations coming to your area next spring, when a wider book tour is planned for Oregon, California and perhaps other regions. Also in the works is a webinar, some book giveaways including a Goodreads raffle, and more articles about the route and my experiences to be published on this site and in other media. If you are interested in having me bring the show to your bookstore or organization, please contact me. I am on a mission to share the stories of this fantastic excursion! 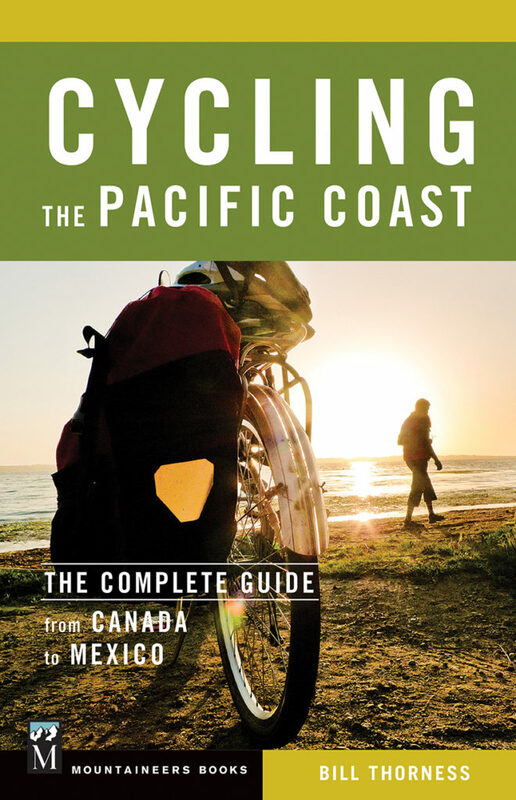 My new book has taken the place of Mountaineers Books’ previous title, the best-selling Bicycling the Pacific Coast, which was in its fourth edition (released in 2005) before the publisher decided to take it out of print and publish my book. That was a great book, and I have much respect for those authors. I agreed to tackle the big project after they described the need for an all-new approach with current routes and amenities, research and information. An exciting project, and a great excuse for a lot of cycling! The book features first-hand accounts and advice about the sights and delights you’ll encounter every day of this bicycling adventure. Along the route, try more than a dozen diversions, including side-trip excursions, orientation tours in six major cities, two island escapes, and rides through two wine-country regions. Can’t take the estimated two months necessary to do the entire trip? No problem! I offer suggested itineraries for one or two-week trips that hit some fantastic highlights, and the logistics to get you to and from the route sections. Those highlights include evergreen forests, ferry rides and Orca whales in Washington, rocky sea stacks washed by constant waves along the Oregon coast, redwoods towering over a quiet road in northern California, and sparkling sandy surfing beaches of southern California. Ready to go yet? You’ll probably want some guidance on how to tackle it, with bike camping, packing recommendations and tips on staying safe and healthy, eating well and finding bike lane compatriots. I’ve got you covered on all those, and much more. I need not tell you that the holidays are on the way, but consider this: Cycling the Pacific Coast would make a great gift for a cycling friend or family member. Suggest this ride as a bucket-list item, and promise to join them! The book is available from Amazon.com, direct from the publisher Mountaineers Books, and can be found at the finest bookstores across the land. Of course, you can special-order a copy from your favorite bookstore through Indie Bound, and then you can support a small, local business. If you come to one of my events, the books will be available for purchase, and I’d be happy to personalize your copy.